Image caption The burglary happened in Fernlea Gardens at the end of March. A woman has branded burglars who raided her parents' house as her 94-year-old dad was dying in hospital as "scum". Rebecca Stafford arrived at the home, in Easton-in-Gordano, shortly after her father died on 30 March to find it had been ransacked. Some of the items stolen included jewellery such as brooches, pearls, and rings given Ms Stafford's 75-year-old mother. Avon and Somerset Police have appealed for information. Ms Stafford, from Lympsham in Somerset, said: "It all felt very surreal. "We were robbed of the time we had to grieve for our dad, because we've had to deal with police and locksmiths. "Because he had just passed away we hadn't even gone through his personal effects. "We're in limbo because we can't think about him." Ms Stafford's mother and father were married for 48 years, and she doesn't believe she will see the items again. "The police have put the alert out but it's like looking for a needle in a haystack." "The burglars are scum, just horrible people. It's unbelievable anyone could do this," she added. 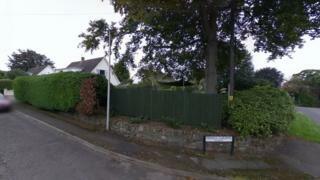 Avon and Somerset Police believe the burglary took place on 30 March between 16:00 GMT and 17:00. A witness saw a man wearing grey clothing in the back garden of the property "acting strangely", the force said.